Soap has been made for at least the last 2000 years in some form or another. The first soaps were formed by boiling animal fat (or olive oil around the Mediterranean) to dryness with ashes from a wood fire, which contain potassium hydroxide. The earliest users were either the Celts (who called it saipo), or the Phoenicians. According to Pliny the Elder, the Phoenicians were using soap as early as 600 B.C. These early soaps were generally used for cleaning clothes and for curing animal hides. The Romans used soap on their bodies as part of bathing, and they spread their soap making skills throughout Europe. In Europe, medieval soap production centered around Marseilles and spread to Genoa and Venice. In England, there was soap production in Bristol as early as the 12th century. In the 13th and 14th Centuries, it started in Cheapside in London. Soap was seen as a great source of revenue by the government and it was taxed. During the Napoleonic wars this tax was as much as 3d per pound, and the tax inspectors would lock up the soap boiling pans to stop illegal production at night. This tax was not repealed until 1835, by which time the exchequer was making £1m a year from the industry. The process remained more or less unchanged until a method of producing large quantities of sodium hydroxide (caustic soda) was discovered in the late 18th century. This opened up the manufacture of good quality soap on a large scale. By the time of the industrial revolution in the late 18th century, soap was more widely available. In fact, Pears Soap dates from 1789. Apparently, Justus von Liebig, a German chemist, said that the amount of soap that a nation used was a measure of its wealth and civilisation. If only that were true now.What's special about our soap Droyt's Clear Glycerine Soap is an all-in, semi-boiled frame soap, cut by hand from a large block and stamped to shape in a box die. With the addition of a few other ingredients, this method can be used to make a genuine transparent soap, i.e. a soap which is clear like glass. 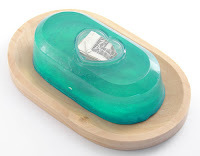 It is not possible to make a true transparent soap by mechanical means. Extra vegetable derived glycerine is added to bring the glycerine content to a level of between 10 and 11%. Fully boiled soap -- In this case the glycerine is removed by adding a brine solution (salt water) to the soap. The glycerine dissolves in the water and is drained off leaving only the soap which is then dried into little flakes or ``noodles''. Cold process soap -- This is an all in soap, but there is no external heating as all the heat comes form the saponification reaction which is exothermic (i.e. an excess of heat is produced by the chemical changes in the components of the reaction. An example would be the dissolving of sodium hydroxide in water). These soaps are normally made with pure coconut oil. The soaps produced are called hard or soft depending on what sort of fats and oils are used, and whether sodium hydroxide or potassium hydroxide is the alkaliProcessing The soaps are then processed. If the soap was made into noodles, it is milled. If it was poured into a frame while hot it is cut. During milling the soap chips are pushed through a machine called a plodder which mixes in colour and perfume and produces a continuous extruded bar of soap. This is then cut into billets by machine. With cut soap, the soap is cut by hand or machine from a large block down to a soap sized billet. After the soap has been made into a billet, it is stamped. There are two kinds of die. One is a capacity die where excess soap squeezes out around the middle and cut off later. This method produces a very regular weight and size and is the way that most domestic soaps are made. The other kind is a box die (or collar die). This contains all the soap which was placed in the mould. This methods produces a less deformed (and therefore more transparent) tablet and also requires less finishing. Opaque milled soap -- This group represents the vast majority of soap produced in the world today. These soaps are made using a fully boiled process and utilise some of the most advanced soap making techniques, usually on a very large scale. After manufacture the soaps are then milled as above. Translucent soap -- This is a relatively modern technique which simulates the old frame method and can produce glycerine soaps which a reasonable level of glycerine (up to 4%). The benefit of this method is that it produces a glycerine soap using a large scale, automatic machine process, which is therefore more commercially attractive. Transparent soap -- There are three ways to make transparent soaps. The first is to pour the whole making into a frame and cut up the soap from a large block. This is very labour intensive. The second way is to pour the soap into individual tubes which produces long bars of soap which then can be processed automatically. The third method is to pour soap into individual moulds, which are then cooled, and the individual soaps released. This can be a completely automatic process. The best method is the first. Pouring into individual moulds requires the soap to be very liquid and thus the water content is very high. This in turn means that the soap is prone to melting, even more than normal glycerine soaps. Glycerine is attractive to water and there is a tendency for such soaps to absorb moisture unless kept dry. Synthetic detergent bars -- There are an increasing number of these cleansing bars on the market. They are made using a different chemical process to normal soap making. They were originally developed to attempt to achieve a product which is closer to pH neutral than normal soap. The first of these was Neutrogena, but there are now others available such as Dove. World production: 10,000,000,000 Ib. per year (of which the U. S. makes and uses about one-third). Per capita consumption: U. S. 25 Ib. ; The Netherlands 24 Ib. ; United Kingdom 20 Ib. ; Japan 7 Ib. ; Brazil 6.8 Ib. ; world average 6.6 Ib. ; Russia 5.7 Ib. (compared to less than 2 Ib. 20 years ago); British India, 4 oz. ; China, 2 oz. Uses classified: World. 92% laundry soap; U. S. 85% laundry soap, 12% toilet soap, 3% miscellaneous. I have be familiar with a only one of the articles on your website now, and I extremely like your line of blogging. I added it to my favorites web age muster and resolve be checking assist soon. Cheer contain into public notice my orientation as approvingly and vindicate me know what you think. Thanks. my son keeps getting blamed for not using soap when he showers. How long does it take for a bar of soap to dry after being wet? this article is very interesting and full of facts but could you post on just about liquid soap that would be great thanks.